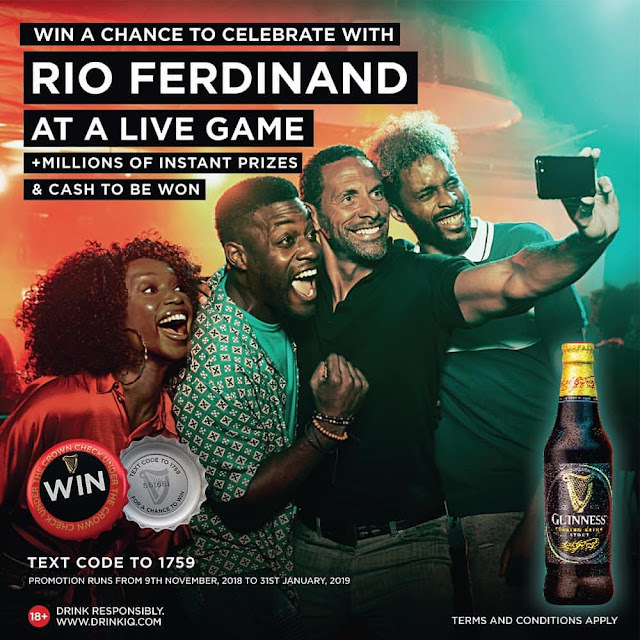 Guinness is giving extraordinary fans the chance to meet Rio Ferdinand and win Millions of weekly instant prizes! 1. Buy any promotional bottle of Guinness stout. 3. TEXT Code To 1759. 2. A chance to Celebrate with Rio Ferdinand‎ at a Live Game. Promo Runs From 9th November to 31st January, 2019. Hello, i've tried sending it from my glo line but it kept saying message not sent. I want to know if it's applicable to all networks or only one network. Hello, i have tried to send the code on countless time with my glo sim card but it kept saying message not sent. So i want to know if it's applicable to one network or to all. Make sure you have at least N10 in your account and retry. Then you will see a pop up message, reply with 1. I just sent the code and am happy to get free 100 card. Na Guiness I sabi! What is the essence of the airtime? N10 was deducted and N50 was given. I guess Trophy 🏆 Lager is preferable. Just sent mine, hope something good come out of this. Pls is there any careline for this ongoing Guinness promo? Please how can the cash award be redeemed? Consult your doctor if symptoms persist after 3days. Pls when will the cash price be redeemed? I sent my code to the number above reply came on and said I won airtime I have waited for the airtime I didn't see please how can I claim my airtime ? Send me a text to winex2k5@yahoo.com. I will guide you. From experience we discovered that more that half of participants that have won cash reward are yet to redeem their reward. I sent the code and I got invalid code sent. What could be the problem? When will winners start to emerge in the draws? Is the promo still goin on? The info was that the promo will end on the 31st of january 2019, but till date, 8/2/2019 they still reply the texts when sent.